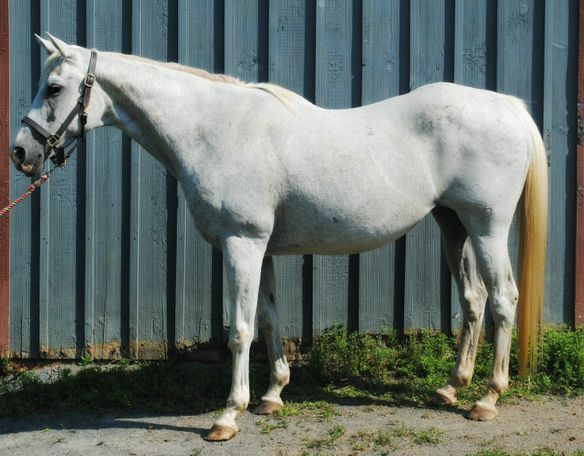 Summer is a 1994 Flea-bitten grey Appendix mare standing at 15.2hh. She came to ERL in July 2013 as a body condition score of two, suffering from starvation, malnutrition and anemia. She has since fully recovered and is a sweet mare with lovely ground manners and a kind eye. She is sound to ride and would make an ideal light-riding only mount due to her age and arthritis. She is a lovely horse with many years of love and fun to offer, but as a senior citizen she has special needs - Summer requires three meals a day of a soaked complete feed and cannot have hay as she quids, due to the condition of what is left of her teeth. Although she requires a little senior management, Summer's adoptive family will receive the sweet love and appreciation only a senior equine offers.